@crackaddict I didn't like how Shen Hong wanted to brush aside the possibility of foul play in ML mom's demise.He is a shrewd guy and I feel he has guessed in part that the inner court ladies had not played fair in the circumstances leading to her death.At this point he is too worried of not getting his household involved in a scandal. He comes across as a very selfish man. I hate ML father for this kind of attitude.. I wonder how he will react in this drama later when his fav daughter Molan hurt ML's face. I just hope he will go to ruin bcoz of his fav concubine Lin... sheesshhh.. Thinking bout him always wanna make me smash things.. I know there is so much discussion about GTY & QH in this forum... For me, I love both character anyway LOL.. Since ML already make a clean break with QH by returning the doll, I'm looking forward for the romance part between GTY & ML... hihihii.. Yes men in that period could have many women even before marriage, but you can see from the drama that none of them had illegitimate children before getting married, to be exact none of them had eldest children born from a concubine. That was considered shameful and will lessen his marriage potential to a woman with status. Moreover when GTY was looking for a wife earlier in the drama, his goal was to find someone who would treat his concubine right. He had no rights to ask such a thing from his main wife and her family. He was selfish, disrespect, ignorant and shameless. That was no action coming from a gentlemen with dignity, nor it was fit for someone of his education background and his status of aristocracy. The fact that that girl was not the main lead didn't stop me from feeling angry for her. He left a very bad first impression so no wonder he is being criticized by viewers. Yes GTY was ignorant in thinking that others would understand that he is trying to take responsibility for the consequences (kids) of his relationship with a mistress, but for me as a viewer it made him look better. However, if I was someone in that time period, I could understand the reluctance of families to allow a marriage between him and their daughters as well as the issues it causes with other children born to the main wife. But I would have to disagree that men didn’t have illegitimate children before getting married. Many probably did, especially if the had women outside of the household where pregnancy prevention isn’t monitored (think that’s how MN got pregnant second time in the novel-didn’t take contraceptive or something). It’s just not depicted in the drama, but a lot of times they don’t keep or care for the kids. They cut ties or as GTY’s father and Yanruo’s mother put it, throw them away before getting married. It happens in both eastern and western cultures in historical stuff I’ve read. They’re just not open about it like GTY; even though he doesn’t fully broadcast it, he doesn’t hide it either, completely breaking the rules. It just so happens that we have a main lead who’s character was shaped from the misery of loosing his mother and poor treatment from his family so then he does not want to abandon his kids. Both of them will get the taste of their medicine soon (tomorrow night). ML's grand plan of revenge will be successful and both will receive their long awaited punishment. @hello210 Agree with you. But unlike those who throw away their children, GTY takes full responsibility and loves his children. He cares for his daughter quite a big deal. Atleast when ML and GTY marries she won't treat his children bad since ML is born from a concubine she understands the suffering of that. Looking forward to their marriage life and i'm curious how ML will treat Rong. So I’m confused on which episodes it’s up to now...based on the schedule today’s (night in China) episode was 30 right? Maybe they’re just late uploading in YouTube? She has already treated rong well. Gave gty advised not to loitering around but to consider Rong's future. Acting on ML's advised gtu brought back Rong to be taken care by the nanny and sent her off to school. 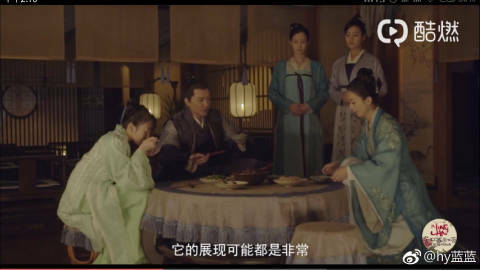 And based on spoiler pictures, ML treated Rong as her own daughter, eating together as one family. @leeza77 thanks it’s what happens when I’m watching two different cut versions and one site somehow got behind with an episode. They must have done a time skip cause Xiao Rong is bigger. Cute family dinner picture. Link down here for Preview and latest raw episode. I'm not sure if it's official. Tell me if it's not and i'll remove it. @hello210 Do you have link for spoiler pictures? @Lunkera I’m not sure if that’s official either since I can’t read Chinese but that’s the site I go to. They normally upload every morning about an hour after live broadcast. They have two different versions that are segmented at different points of the drama for each episode. But today one version is 1 episode behind. The other version doesn’t update until the afternoon. Regarding spoiler pictures, sorry I don’t have a link. I was referring to the picture the leeza77 put in her spoiler comment. @leeza77 Do you have a link for spoiler pictures? The weibo discussed on the props and in the segment there is that picture. @leeza77 Thanks, watched the clip quickly. I don't understand a thing but the segment was really nice to watch. For the people who have read the novel and can remember ... can you describe GTY and ML wedding according to the novel ? Was it grand ? I hope karma catches up with him , ML's stepmoms and Hong Sheng realizes his follies. I love QH,GTY and ML.Their characters are nicely etched out.I feel GTY and ML are kindered spirts.Both have faced similar adversarial stepmoms,indifferent dads,love interests who failed to support them.Had to fight for survival since they were young.Therefore understand each other well.It reflects in their interactions.You see a side of theirs which otherwise doesn't appear with other characters they interact. I just want to clarify that there are three types of sons main wife born di, concubine born shu and illegitimate sons who were born of outside women and did not get recorded in family ancestry book. Shu sons are considered legitimate. In Song Dynasty, shu son, however, has right to equally divide family assests with di sons though they do not have right to inherit the nobility title (ref: Concubines in Song China, women and the family in history of China). The illegitimate sons will not have right to any family assests and their names won't be registered into ancestry book. @Golden FlowerThank you for the information. So, I have a question about the Gu house. There are 3 sons and all of them from main wives if I remember right. The oldest son is from the first wife who is from a noble family, is born a di, and when she died Marquess Gu married Ting Ye's mother who is a merchant's daughter nevertheless the general was forced to make her the main wife by the contract he made with her father, so is GTY a di too? Then the marquess remarried the wicked stepmother who also had a son who is also a di? So according to the rules who among the 3 di sons can be made the heir? Here, GTY is made heir but he is not the oldest son and mother is a merchant's daughter. Thank you for the information. So, I have a question about the Gu house. There are 3 sons and all of them from main wives if I remember right. The oldest son is from the first wife who is from a noble family, is born a di, and when she died Marquess Gu married Ting Ye's mother who is a merchant's daughter nevertheless the general was forced to make her the main wife by the contract he made with her father, so is GTY a di too? Then the marquess remarried the wicked stepmother who also had a son who is also a di? So according to the rules who among the 3 di sons can be made the heir? Here, GTY is made heir but he is not the oldest son and mother is a merchant's daughter. So to my understanding, it doesn’t matter about the lineage of the mother as long as she was made the main wife making her son di born. Since inheritance of the title is by order of birth of all di sons, the oldest brother inherited after the father died. But he’s sickly with no sons which makes GTY, the 2nd oldest the heir unless he adopts a son from the 3rd brother which then they can bypass GTY. Unless both oldest brother and GTY dies or GTY gets erased from family registry, 3rd brother has no chance to inherit. Hence all of stepmom’s scheming. I think in the novel, when GTY didn’t get erased from the family registry nor get killed, the stepmom tried to get the older brother to adopt a son from the 3rd brother. She tried her darnest to not let GTY inherit. If they delay the first rebellion till after GTY and ML are married, then it might be possible. The thing is, even if they skip some events or change the sequence in which the events happened, they will still need to show the first rebellion coz thats how GTY earned his position as a general. Then the other 3 main important events that happened before GTY's proposal, almost engagement with He Hongwen and his cousin coming to ruin everything, Rulan falling for the poor scholar and Molan getting married to Liang Liu. If they completely skip the HHW cousin thing or the engagement with HHW never happens and If Molan getting married is in next 2-3 epis then its quite possible that GTY and ML marriage happens by the next weekend. It will take at least that many episodes to cover different story tracks happening right now. Not to forget ML is also investigating her mothers death. Maybe we'll have a time jump. In a trailer i see ML hitting the bell outside of Palace i think maybe that is to save GTY whose locked up or something. Can i just say how glad i am they cut this crap out . You say that but doesnt Molan marry out with the help of her mum? sure its miserable but still. GTY splurged a lot of money.....and I think some big political and military figures were in attendance ...so yeah it was big affair. edit.....I went and checked...heres the list...Apparently GTY filled their whole yard with his gifts. 34 gold dragon phoenix bracelets....another 18 pieces of some dragon phoenix jewelry I can't make out. Then there were different kinds of fish, wine, tea and candy for all 4 seasons. GTY didn't know instead of making people happy his gifts made some people unhappy. Da niang and Rulan to be exact. Both had no objections to GTY marrying ML before but when they saw the bride price both start to regret letting GTY go from their hands. And GTY was so petty sending the bride price for ML on day Rulan's lite-bride price came.